Psychic processes which ordinarily are consciously controlled can become instinctive when imbued with unconscious energy. This is liable to occur when the level of consciousness is low, due to fatigue, intoxication, depression, etc. 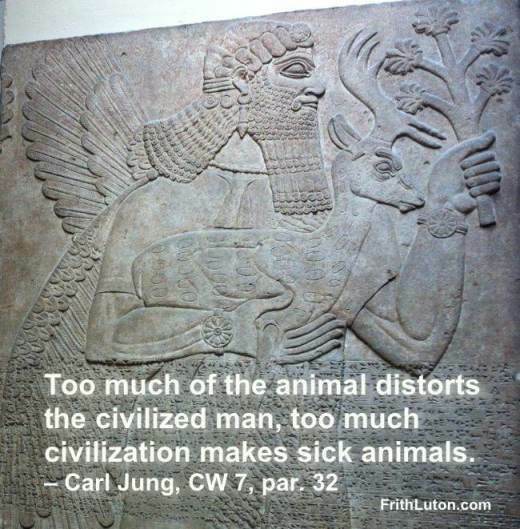 Conversely, instincts can be modified according to the extent that they are civilized and under conscious control, a process Jung called psychization. Jung identified five prominent groups of instinctive factors: creativity, reflection, activity, sexuality and hunger. Hunger is a primary instinct of self-preservation, perhaps the most fundamental of all drives. Sexuality is a close second, particularly prone to psychization, which makes it possible to divert its purely biological energy into other channels. The urge to activity manifests in travel, love of change, restlessness and play. Under reflection, Jung included the religious urge and the search for meaning. Creativity was for Jung in a class by itself. His descriptions of it refer specifically to the impulse to create art. Jung also believed that true creativity could only be enhanced by the analytic process. Instinct and archetype are a pair of opposites, inextricably linked and therefore often difficult to tell apart. When consciousness become overspiritualized, straying too far from its instinctual foundation, self-regulating processes within the psyche become active in an attempt to correct the balance. This is often signaled in dreams by animal symbols, particularly snakes.